"My Blog has moved to Facebook where you can interact with me and leave your honest opinion! www.facebook.com"
"Just wanted to say a huge thank you for making our special day that little bit more special. 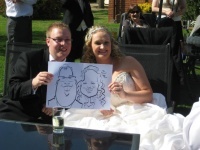 We absolutely love our caricture and are getting it framed! All of our guests are also so happy with theirs and to have a souveneir from our day. Thank you once again Dean and Carole 3rd September 2011 "
"Hi Tony, just to let you know, I received the prints yesterday and got them framed today - they look absolutely magic! Thank you so much for the amazing caricature. When my fiancee first came up with the idea for giving it to my mates as a wedding present i thought it would be really cool but the final caricature has totally exceeded all of my expectations. It is absolutely awesome and the guys are going to be blown away by it. I'm sure we will all have our copy of the image hanging on our walls for a long time to come! So thanks again for producing such a brilliant piece of art, and for making all the changes I asked for to get it looking exactly how I wanted it. If I ever need another caricature done I know exactly who i'll be getting in touch with! Best of luck in the future, Cheers Jamie"
"I also sold the rights to my royal design to a brewery. They were so chuffed they sent me some samples! Gosh market research can be tough!" "Well it's arrived and it looks glorious! My Royal Wedding Tea Towel is out and available in most Clinton Cards, Brighton Pavillion shop and on amazon. Let me know what you think of it..... Amazon Link: http://www.amazon.co.uk/Royal-Wedding-Commemorative-Towel-Britain/dp/B004KS7UFQ/ref=sr_1_1?ie=UTF8&qid=1303895697&sr=8-1"
"Just come back from the Girona International Society of Caricature Artists Convention. Had a great week with some of the worlds best artists. Whilst there I was voted the winner in the category 'Best Likeness' and won the coveted Golden Specs award. A little bit chuffed with that." "I've just finished this for a tea towel printer in Bristol. He wants to do a collection of 'great Britons' after this. I notice the palace have banned the royal faces from appearing on tea towels so this may sadly have to remain un official." "My aged neighbor Beryl asked me to do an honest caricature of her 'and don't spare the wrinkles!"" "Allow me to introduce my son - Eddie Thomas Parsons"
"God I'm awful at blogging! I've recently been on set with the cast and crew of the BBCs Merlin. Angel Coulby who plays Guinevere asked me to draw the cast and crew as a big thank you at the end of the filming for the second series. I'm a massive fan of the show and was delighted to meet everyone and spend the day wandering around Camelot (near Cardiff)! They made me feel very welcome and a tad star struck." "Back at the Excel for 3 days drawing at a trade exhibition. Seven hour days at the easel and I'm exhausted! Friday night was in the London Rowing Club at Putney and Saturday was drawing page 3 models at Nicola McLean's wedding - yikes it's a tough life!" "Christmas work is now flooding in. If you want a commission you'd better hurry!" "just got back from a damp week in Cornwall. It did however give me an opportunity to do some recreational painting and try some new techniques. I've now begun work on a caricature of Chris Hoy, olympic cyclist, gold medalist and part of the British team of super-heroes we appear to have sent to China." "All my regular clients will know I'm a communications junkie - lots of gismo's and gadgets for email, calls etc. Well now my hard drive's died taking with it everthing since April (thanks to my backup gismo also being broke!) To top it all tomorrow I switch from Vodafone to o2 (cos I've got a new iphone to speak to the broken mac) so emails may or may not get answered. Best off calling me on the landline for a couple of days!" "It turns out the one of my recent clients works for Lindt chocolates. this is a birthday present from his work colleagues, with chocs as a thank you! Many thanks." "Ok, I know this isn't the time or the place. 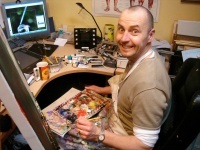 You may or may not be aware that I also run http://votewise.co.uk with Mark Bell who built this site. We list all elections and invite all of the candidates to take part. It's been going since September and it's growing furiously (a couple of thousand visitors a day at the moment). Well David David has just taken Part in the Haltemprice and Howden Parliamentary election which is quite a coup for the site as it's now being taken seriously by the very top level of Britain's political establishment. Votewise is now well on it's way to becoming a 'must see' before you vote!" "I was discussing with my dad a way of moving the new chicken house around the garden, trouble was we couldn't find any wheels. I happened to be speaking to Jess at Wybone about next years booking on the bin stand and she just 'popped' these in the post. Industrial strength bin cart wheels. We now have the poshest Chicken shed in Brighton. Above and beyond the call or what?" Bin there - done that! 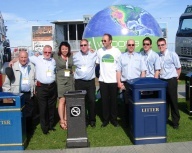 "Just returned from a cracking two days working on a stand at a waste and recycling trade show in Torquay. I was drawing as an attraction on the Wybone bin stand. We were all out in the blistering sun under constant attack from Seagulls but the caricatures went down a storm! I owe a massive thanks to Mr Wyatt, Jessica, Phil, Richard, John and Steve who went out of their way to make me feel welcome. I was included in all of their hospitality activities and looked after like a king. I'm now trying to shift the Barnsley accent I seem to have picked up! Thanks guys, I look forward to working with you all next year! http://www.wybone.co.uk/"
"Tony, Have received pic in super condition. Am most impressed by your talent and when it gets around Cambridge who knows what may transpire. Again many thanks for all your efforts and my best wishes to you and yours. Bill"
Snowboarding in my birthday suit! "Have just come back from a weeks snowboarding in La Tania with a group of chums. Whilst there I had a birthday and to celebrate I was made to spend the day wearing a cow suit. If you've never spent the day being moo'd at by strangers I can thoroughly recommend it! A super week was had by all with good snow and no breakages - I also took the opportunity to draw everyone else in the Chalet." "A Cracking gig yesterday for the Opening of a new House of Fraser in Gerards Cross. I was working with Mark Williams (the magician on my links page). Poor Mark - I had such a massive queue that it blocked up the whole floor and Mark had to marshall the crowd. Still it's nice to be appreciated! " "I've just come back from two days in Dublin where I visited Niall o'Loughlin in order to steal his ideas, a fair amount of his painting equipment and raid his fridge. I was made very welcome and it was great to see the master at work. On my return I sloped off to spend a fortune in the art shop after seeing Nialls wonderful gadgets. Check out Niall's work from the link on my links page." 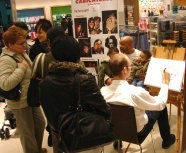 "Just done two days of live drawing at Selfridges in Oxford Street for Stella McCartney. I met the lady herself and she turned out to be lovely! On the second day (Valentines day) I was working by the Stella Lingerie section - turned out to be a right eye-opener!" "Moving in a slightly better direction..."
"Got fed up with his face - back to the drawing board!" "My cousins hubby is a world class trumpet player. He's finally got round to launching his own site where you can listen to him play. He played the fanfare at my wedding and he was spectacular - well worth a listen! (link at the bottom of my links page)"
"Filled in a bit of the background, trying to decide on a colour." "A bit more shading, gradually building it up....."
"Well here it goes, the first evenings work on the Robbie painting." "I have decided to go a little less exaggerated and make it into an acrylic painting. I've been doing a lot of digital stuff recently so it would be good to pick up a brush again. Helen has insisted I tidy up my radio controlled glider and all my other stuff off the dining room table before I'm allowed to cover it in painting stuff. Anyway here's the first sketch which I shall transfere to the canvas." "A while ago I did this pencil sketch of Robbie Williams." "I was awoken by the postman this morning bearing gifts. Couldn't remember having bought anything so was a little curious. Those lovely folk at Liz Earl (Sat 26th Jan party I drew at) had sent me through a mens skincare goody bag and a note saying thanks for making the night extra special. I'm truly touched!" "From Saturday nights client...'Thanks so much for your time and effort on Saturday, you were a roaring success…..there are several pictures stuck up around the office already!'" "Crawled back in at 2 this morning. I was drawing live at the http://www.lizearle.com/ belated new years do. The Cowes Yacht Haven events hall on the Isle of Wight was done up in absolute splendour like the inside of the Moulin Rouge set with windmils, feathers, smoke machines - the lot! And lots of young ladies in fishnets and very little else.... A fab night with some craking drawings and a happy crowd - I'll try and get some pictures soon." ""Good morning Tony, 2 friends and I are driving to Mongolia in a beaten up microvan we bought on ebay for £92 in aid of charity. We leave in July but before that we are seeking sponsorship from individuals but also some companies. Before we can do this we need press exposure and the van looking good. We thought it would be cool to have one of the panel on the van containing caricatures of the three of us leaning out as though it were a window." Is it just me or does everyone get emails like this?" "This is a sketch of everyones favourite sinner - Miss Winehouse. Wonderfully talented though she is, this very much feels like a case of quick! Draw her before she dies. (Hope I'm wrong)"
"Apparantly I've not got enough women on the site - My wife thinks I need more female celebs - I quite agree!" "Hello? (knock knock) is this working? A very exciting day today - My new website seems to have gotten airborne! over then next few weeks I shall frantically update it and hopefully add some new features. Please take a good look round and give me your feedback!" 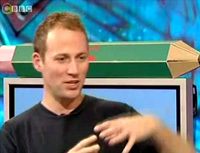 "I was invited to draw on CBBC recently, you can watch it ... here."